The al-Ansar Brigades says it fired five rockets at Israeli targets on Tuesday in response to an airstrike that killed a 25-year-old Palestinian. An Israeli military spokeswoman was not immediately familiar with any rockets landing in Israel. The brigades, affiliated to the al-Ahrar movement, said the rockets were a response to the killing of Haitham al-Mishal and Israeli violations of a truce agreed in November. "The occupation does not respect the truce nor fulfill its commitments," the group said in a statement. "The truce can go to hell." Israel said its strike on a motorcycle west of Gaza City early Tuesday targeted "a global jihad-affiliated terrorist" involved in an April 17 rocket attack on Eilat. On Tuesday afternoon, witnesses reported two explosions in Rafah in the southern Gaza Strip. 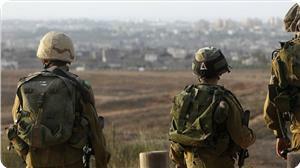 An Israeli army spokeswoman said there were no airstrikes in the area. The military wing of the Democratic Front for the Liberation of Palestine on Tuesday said it would respond to Israel's assassination of a Palestinian in the Gaza Strip. 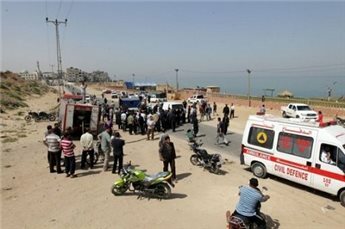 Israeli warplanes on Tuesday fired at a motorcycle west of Gaza City, killing 25-year-old Haitham al-Mishal, a security guard at al-Shifa hospital, health ministry spokesman Ashraf al-Qidra said. Israel says it targeted "a global Jihad-affiliated terrorist" involved in a rocket attack on Eilat. The National Resistance Brigades said in a statement that it would respond to the strike and vowed to continue resistance until Palestine is liberated. Militants in the Gaza Strip on Monday sent a mortar shell crashing into an open area in southern Israel, a day after a rare retaliatory air strike by Israeli forces, the army said. 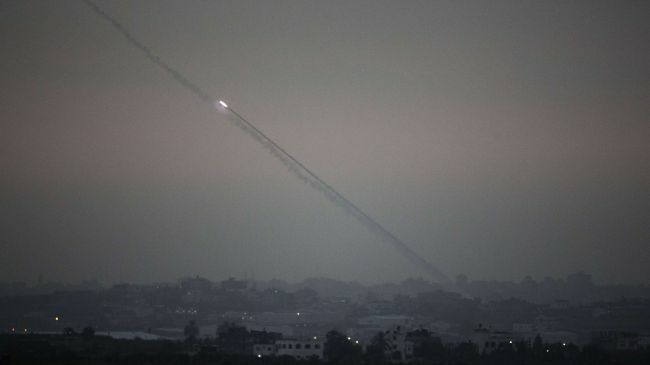 "A mortar shell struck an uninhabited area in the Eshkol region near the security fence between Israel and the Gaza Strip," an army spokeswoman said on Monday. The incident came 24 hours after Israeli warplanes launched air strikes against the southern Gaza town of Khan Younis, targeting weapons depots and a training site for the armed wing of Islamic Jihad, the military said. The strikes, which came in response to rocket fire that hit open fields in southern Israel on Saturday, caused no casualties. The Israeli authorities on Sunday also closed the Kerem Shalom goods crossing until further notice after Saturday's rocket attack, the defense ministry said, and restricted movement of people across the separate Erez crossing to "humanitarian cases". Israel also cancelled visits that Gaza-based Palestinians were to make Monday to see family members held in Israeli jails, the Red Cross said. "The Israeli authorities told us yesterday that the planned visits of Palestinians from Gaza today were cancelled," ICRC spokeswoman Noora Kero told AFP. "This affects 87 people who were supposed to travel to Israel." A spokesman for the Israeli defense ministry said the visits were only cancelled because of the restrictions on the Erez crossing. Israeli Prime Minister Benjamin Netanyahu told Sunday's weekly cabinet meeting that Israel would retaliate with great force against any rocket or missile fire. "I want to make it clear that we will respond in a very offensive way against any rockets or missiles. We will take all necessary measures to ensure the security of Israelis... on all fronts," he said. Israeli F16 warplanes bombed on Sunday night a Palestinian resistance site in Khan Younis and an empty piece of land west of Rafah area in the Gaza Strip. 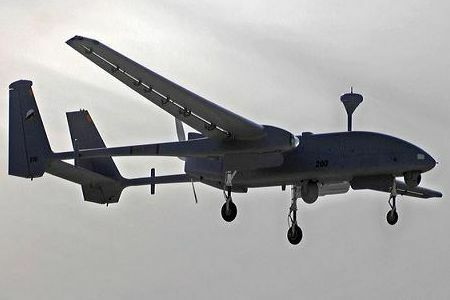 Concurrently, Israeli drones and warplanes were reported overflying intensively different areas of the Gaza Strip. 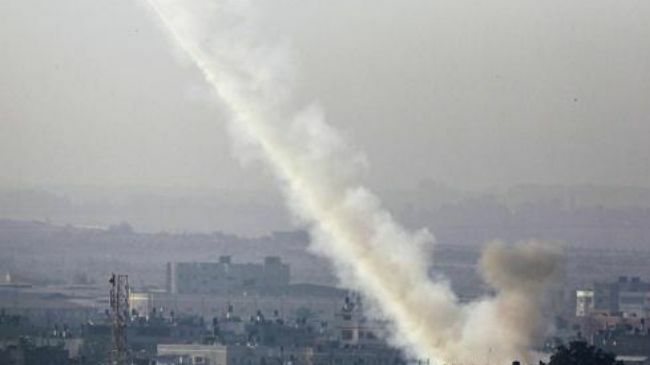 The air raids took place a few hours after the Israeli army claimed that Palestinian homemade rockets landed in Netivot settlement and the Negev region. The Palestinian information center (PIC) reporter in Gaza said that one of the Israeli aerial attacks caused material damage to a resistance training site west of Khan Younis, belonging to Al-Quds Brigades, the armed wing of the Islamic Jihad Movement. 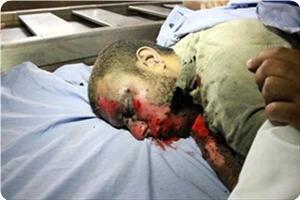 He also said that another airstrike happened shortly after the first raid in an empty area west of Rafah. Meanwhile, the medical authorities in Gaza did not report about any casualties among civilians or resistance fighters as a result of the attacks. Israeli warplanes bombed two sites early Sunday in the south of the Gaza Strip belonging to the military wing of the Democratic Front for the Liberation of Palestine. 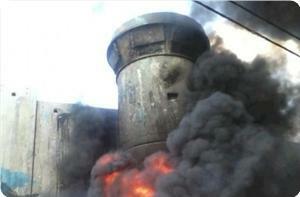 No injuries were reported, but a training site was damaged, a statement from the National Resistance Brigades said. Israeli aircraft fired two missiles at the site, the groups said. Israeli aircraft also bombed a site belonging to Islamic Jihad's military wing in southern Gaza. 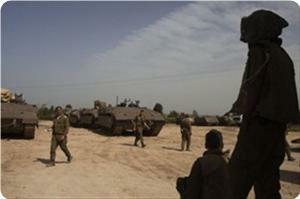 Israel's army confirmed the operation and said it followed a rocket attack from Gaza. "A short while ago, in response to rocket fire this evening, an IAF aircraft targeted a terrorist weapon storage facility and a Hamas training installation in the southern Gaza Strip. Direct hits on the targets were confirmed," the military said in a statement. "These sites were targeted in response to the rocket launched at civilian communities in southern Israel. "The IDF will not tolerate any attempt to harm Israeli civilians, and will not allow for the reality before Pillar of Defense to take place again and threaten Israeli civilians. The Hamas terror organization is solely responsible for any terrorist activity emanating from the Gaza Strip." The Palestinian resistance on Monday evening repelled an Israeli military incursion into the east of Beit Hanoun district in northern Gaza. Eyewitnesses told Quds Press that a force of foot soldiers infiltrated dozens of meters into Beit Hanoun, but resistance fighters fired a hail of mortar shells at them forcing them to draw back and leave the area. 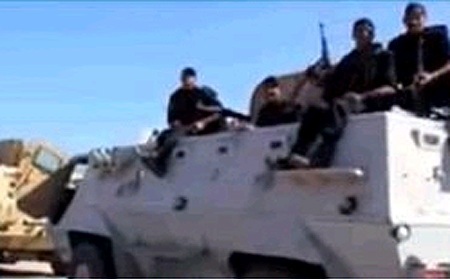 They said that the invading soldiers reached an area between the memorial site and the transmission site east of Beit Hanoun when they were spotted by a group of resistance fighters. Earlier, the Brigades of Martyr Abu Ali Mustafa, the armed wing of the popular front for the liberation of Palestine, claimed responsibility for opening fire at an Israeli military force in Beit Hanoun, but it is still unknown if the same Brigades launched the mortar counterattack. This Israeli military incursion is one of many violations that have been committed by Israel since it accepted an Egyptian-brokered truce and ended its wanton war in November 2012. The Israeli army has violated the truce many times since then killing four Palestinians, wounding several others, kidnapping about 40 fishermen and destroying many fishing boats off the coast of Gaza. A rocket landed at dawn on Saturday in western Negev, south of the 1948-occupied territories, no injuries were reported, Israeli sources claimed. 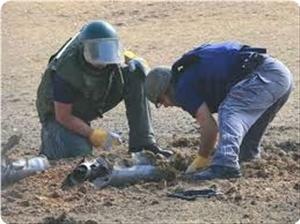 A rocket fired from the Gaza Strip landed in an open area of Eshkol settlement in western Negev. 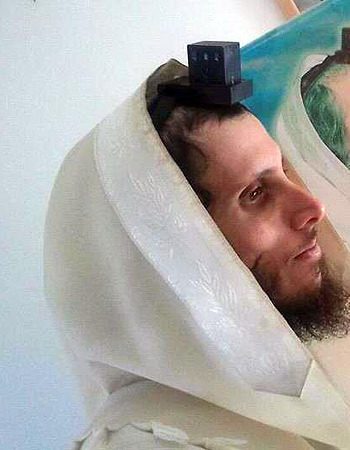 No injuries or damage were reported, Yediot Ahronot stated. 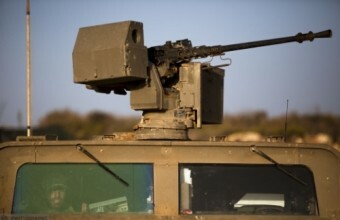 The projectile fired from the Gaza Strip landed near a community in the Eshkol Regional Council in Israel, the Hebrew radio reported. No injuries or damage were reported during the explosion, the sources said without mentioning whether sirens sounded or not. On Thursday, two rockets fired from the Gaza Strip exploded in the same area in the Eshkol Regional Council. The Israeli occupation authorities have repeatedly threatened to launch a new war on the Gaza Strip in case the rockets continued to land in violation of the truce between the resistance and the occupation after the recent 8 day-aggression on Gaza in November. The Israeli occupation has committed many violations of the agreement since then. The Tel Aviv regime says two rockets fired from the blockaded Gaza Strip have hit southern Israel. 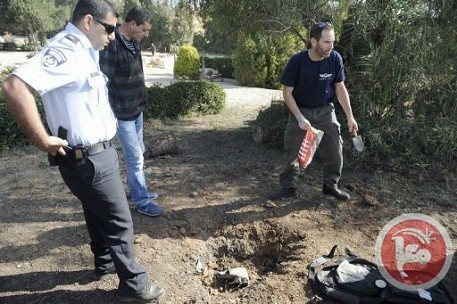 Louba Samri, a spokeswoman of the Israeli police, said on Thursday that two rockets fell into “uninhabited areas of the Eshkol region” without causing any casualties or damages. On April 17, the Israeli military said that two rockets fired from Egypt’s Sinai Peninsula hit Eilat resort in southern Israel. However, Cairo denied the report. Also on April 4, the Tel Aviv regime said a number of rockets were fired from Gaza with one exploding inside Israel. The incident took place two days after Israeli warplanes carried out airstrikes against Gaza. The Israeli airstrikes are seen as a violation of a truce that ended an eight-day Israeli war on the Palestinian territory in November 2012. Over 160 Palestinians, including women and children, were killed and about 1,200 others injured in the Israeli war on Gaza from November 14 to 21. The Israeli regime and the Palestinian resistance movement Hamas agreed to an Egyptian-brokered ceasefire. Sources from the Gaza Strip revealed that a bomb exploded in an Israeli vehicle while raiding east of Khan Younis, south of the Gaza Strip. Israeli forces infiltrated Gaza borders and went nearly 300 meters into the eastern part of Khan Younis, according to witnesses. A rocket fired from Gaza crashed into southern Israel on Sunday, without causing casualties or damage, shortly after the arrival of US Secretary of State John Kerry on a peace bid, police said. Police spokesman Micky Rosenfeld told AFP the rocket landed in an uninhabited sector of the Negev desert, as Kerry started a three-day visit to Israel and Palestine. Kerry is to hold a new round of talks with Israeli and Palestinian leaders on how to break a years-long impasse in direct peace negotiations. Israeli Defense Minister Moshe Yaalon warned on Wednesday that his country would respond to any attacks on its territory and not allow its people to come under fire. The Gaza-Israel border has been largely quiet since November when an Egyptian-brokered ceasefire ended a deadly eight-day confrontation between Israel and Hamas. But since late February, there have been four other cases of rocket fire on Israel, three of which were claimed by Salafist militants. The Israeli military says a number of rockets have been fired from the besieged Gaza Strip with one exploding inside Israel. 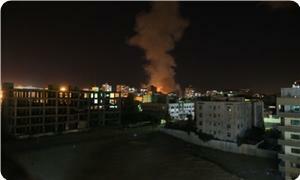 The rockets fired from the besieged enclave on Thursday were in response to Tel Aviv’s recent attacks. According to an Israeli military spokesman, one of the rockets exploded in southern Israel. No reports of casualties have been released. Palestinian rockets were also fired into Israel on April 2. On Wednesday, Israeli Minister for Military Affairs Moshe Yaalon issued a warning to Gaza that the strikes would be met with a similar response. 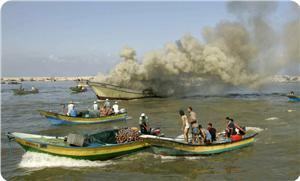 The incident comes two days after Israeli warplanes carried out airstrikes against the Gaza Strip. Two rockets fired from the Gaza Strip have landed near the Israeli town of Sderot, following the Tel Aviv regime’s airstrikes on the Palestinian territory. The rockets landed in an open area on Wednesday. No damage or injuries were reported. 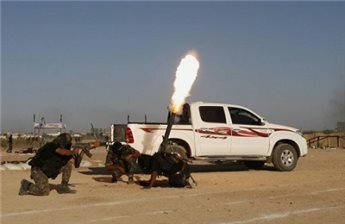 The retaliatory rockets came after Israeli warplanes bombarded an open area in northern Gaza on Tuesday. The airstrikes were the first such attacks since a truce ended an eight-day Israeli war on the coastal enclave in November 2012. Israeli Minister for Military Affairs Moshe Yaalon has issued a warning over the rockets fired from Gaza, saying the Tel Aviv regime would respond with a strike. Also on Tuesday, one projectile was fired from Gaza into Israel. 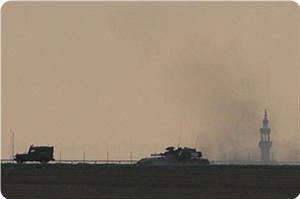 Earlier in the day two mortars were fired from the Palestinian territory but they landed without causing damage.